Because teachers cannot be trusted to grade the papers of their students, in NY State they're prohibited by law from doing so. Thanks Merryl. Teachers might be prejudiced in favor of the kids, and pass them. How unforgivable. They might even find ways of taking 64 papers and finding another point, and that would be a disaster. It's far better to make kids sit in classes for half a year, a whole year, or the entire summer because that's how you really make them love a subject with which they're struggling. A 64 paper is far different from a 65 paper. A kid who scores 65 knows the subject adequately, while one who scores 64 is an abject failure and must suffer for sins against humanity. That's a given, and we can all be thankful that Merryl Tisch and John King and their gaggle of privately-funded interns protect us against such outrages. But Michael Bloomberg took this brilliant law and brought it to the next level. Not only do city teachers not mark the papers of their students, but they also are not permitted to mark the papers of anyone in their school. You see how that works? Teachers are so thoroughly corrupt that they may not only support their students, but also support their schools. Therefore, it's far better to send their papers to people who don't know them at all, who don't give a crap how they do, and who won't bother looking twice for any merit they may have missed. Because it's a tough world out there, and kids may as well begin now to face the fact they can expect kindness from absolutely no one. Today a bunch of English teachers went to a Queens high school to anonymously mark papers. To welcome the teachers on this sub-freezing day, the great minds who run that building decided they would check driver licenses. Naturally, they had them wait on line, and if the line had them standing out in the freezing cold, well, too bad for them. This was the way the kids were treated, so why shouldn't the teachers be treated that way too? Why the hell should this school accept DOE ID from these teachers? That could be dangerous, and it's a well-known made up fact that people counterfeit school ID left and right, because who doesn't want the privilege attendant to being a high school teacher? The half-price donuts, the women throwing themselves at you, the money pouring in from virtually everywhere. I understand this beautiful scene was sullied when the chapter leader went out screaming for reasonable treatment of these people, but the sensible minds over there prevailed and would not give in. Thank goodness we have such a great system. Schools Chancellor Carmen Fariña today announced new members of her leadership team at Department of Education (DOE) headquarters. Dorita Gibson, previously the Deputy Chancellor for Equity and Access, will assume the role of Senior Deputy Chancellor and the Chancellor’s second in command. With more than 30 years experience in the public school system, Dr. Gibson has served as a teacher, assistant principal, principal, regional and supervising superintendent, and Deputy Chancellor. In this new and expanded role, she will oversee all aspects of school support, Cluster and Network management, superintendents, support for struggling schools, District 79 programs, and school communications. As head of Equity and Access under Chancellor Walcott, Deputy Chancellor Gibson oversaw District 79, a citywide network of over 300 alternative schools and programs serving over-age, under-credited youth; the Office of Adult and Continuing Education; and the Department’s Young Men’s Initiative work. She created the DREAM-SHSI program, which helps low-income middle school students develop skills for the Specialized High Schools Admissions Test, as well as the Summer Quest program, which provides students with summer learning opportunities aimed at closing the achievement gap. As she moves into the Department’s number two role, Dr. Gibson will bring her considerable expertise in expanding opportunities for underserved school communities. Chancellor Fariña also appointed Phil Weinberg, previously the principal at the High School of Telecommunication Arts and Technology in Brooklyn, as Deputy Chancellor for Teaching and Learning. With more than a dozen years as a principal and nearly three decades of experience in New York City public schools, Mr. Weinberg will oversee all professional development and curriculum, performance and accountability, Common Core and college-readiness initiatives, Career and Technical Education, and instructional support. The high school Mr. Weinberg has led since 2001 has achieved a more than 35 percent increase in graduation rates since 2005. The recipient of a 2012 Sloan Award for Public Service, Mr. Weinberg previously served on the DOE’s Division of Academics, Performance, and Support Advisory Group. In one of his first acts as Deputy Chancellor for Teaching and Learning, Mr. Weinberg named Anna Commitante as his Executive Director of Curriculum, Instruction and Professional Development. A 27-year veteran educator, Ms. Commitante was previously a Deputy Cluster Leader of Curriculum, Instruction and Professional Development. In her new role, she will provide leadership in curriculum development, assist schools as they transition to the Common Core Learning Standards, and direct a comprehensive professional development training program using research-based instructional methods. Dr. Dorita Gibson has spent more than 30 years in the New York City school system as a teacher, assistant principal, and principal at various schools in Queens, and has served as a deputy, regional and senior supervising superintendent. Appointed Deputy Chancellor for Equity and Access in May 2011, Gibson oversees programs and initiatives that focus on ending long-standing racial, ethnic and socioeconomic disparities and directing supports to high-need communities. She directs District 79, a citywide network of over 300 alternative schools and programs serving over-age, under-credited youth whose schooling has been interrupted, the Office of Adult and Continuing Education, as well as the Department’s Young Men’s Initiative work. As Deputy Chancellor, Gibson has expanded Advanced Placement courses in the City’s most underserved neighborhoods and communities. She also created the DREAM-SHSI program, which helps low-income middle school students develop skills for the Specialized High Schools Admissions Test, and the Summer Quest program to improve, expand, and sustain summer learning opportunities in the South Bronx as a key strategy for closing the achievement gap. Gibson holds a Doctorate in Education from New York University’s Steinhardt School of Education. Responsibilities: Overseeing District 79, a group of alternative schools that include G.E.D. programs and adult education, as well as schools for incarcerated students. She also runs programs aimed at closing the achievement gap. Schools Chancellor Carmen Fariña promoted a Bloomberg-era official and plucked a longtime principal from his Brooklyn school today as she began to fill out the Department of Education’s inner circle. Dorita Gibson, previously the deputy chancellor for equity and access, will be Fariña’s second in command, the Department of Education announced today. In her previous position, Gibson supervised the department’s system of alternative schools and its work with the Bloomberg administration’s Young Men’s Initiative, and launched new programs to diversify selective high schools. Phil Weinberg, principal of the High School of Telecommunication Arts and Technology, is the department’s new deputy chancellor for teaching and learning. 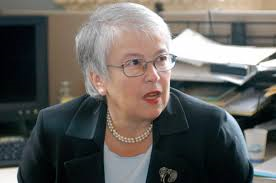 That position, which Fariña herself held a decade ago, disappeared in 2010 when the department dissolved its division of teaching and learning. Weinberg has chosen the city’s former gifted education chief, Anna Commitante, to be his top deputy. Commitante had been working as a deputy in one of the department’s five “clusters,” providing instructional support to dozens of schools. Together, the three appointments offer the clearest picture yet about Fariña’s priorities. All three of the new hires have been in the system for decades and have been teachers and principals in the school system. Gibson has served at almost every level of school leadership, starting as a teacher in Queens and serving as a principal, regional superintendent and deputy superintendent. Her appointment as senior deputy chancellor also signals that Fariña doesn’t intend to purge some Bloomberg-era policies and appointees from the department. Weinberg has served as the principal at Telecommunication since 2001, the school where he started his career as an English teacher in 1986, according to a New York Times storyhighlighting his longevity as a principal. Weinberg has also voiced concerns about the new teacher evaluation system, which he said put too much faith in data, rather than principals’ judgment. “Newly necessary distractions like marketing and fund-raising and data analysis may have seemed more important than getting into classrooms and working with teachers on how to plan lessons and ask questions,” he wrote in 2012. Phil Weinberg has nearly three decades of experience in New York City’s public schools. For more than a decade he taught English at the High School of Telecommunication Arts and Technology in Brooklyn. He later served as assistant principal there, and was named principal in 2001, a position he has held for 13 years. At this large, urban, high-poverty school, in which more than 70 percent of students are Title 1 eligible, Mr. Weinberg established small learning communities, through which his students saw extraordinary success: the graduation rate has increased by more than 35 percent since 2005. A 2012 recipient of the Sloan Award for Public Service, Mr. Weinberg holds a bachelor’s degree from Swarthmore College and a Master of Arts degree from Columbia University’s Teachers College. Anna Commitante, a 27 year veteran educator, was most recently Deputy Cluster Leader of Curriculum, Instruction and Professional Development in Cluster 2. Previously, Ms. Commitante was the K-12 Director of Literacy, Social Studies and Gifted and Talented Programs for the NYC DOE. She began her career in education as an elementary school teacher at PS 29 in Brooklyn, worked in school support as a district literacy coach/staff developer, and led a job-embedded professional development program for schools at City Hall Academy. Ms. Commitante also served as principal of New Voices Middle School in District 15, Brooklyn, a school that offers a strong humanities curriculum and fully integrated arts program. She holds undergraduate and graduate degrees from Hunter College and a degree in educational administration from City College. 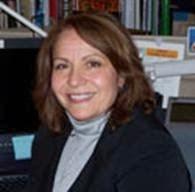 Anna Commitante has 23 years of experience with the New York City Department of Education and prior to joining Cluster 2 was the citywide Director of English Language Arts, Social Studies and Gifted/Talented & Enrichment. Prior to that position, Anna was the Executive Director of City Hall Academy, a professional development laboratory school located on the first floor of the DOE main office in the Tweed Courthouse. The programs at City Hall Academy demonstrated ‘best practices’ and innovative instruction for students, teachers and administrators in grades K-12. Anna received her education at Hunter College (BFA, MA) and City College of the City University of New York (SDA). Anna began her teaching career as a classroom teacher at P.S. 29 in Brooklyn, New York. She left classroom teaching to work as a district literacy staff developer, before assuming leadership of a middle school in Brooklyn. Throughout her teaching and administrative career, Anna has worked with many educational and cultural organizations and has focused on curriculum design and development across grade levels and disciplines to support student engagement and achievement. Are we seeing a "new" Carmen (Farina)? 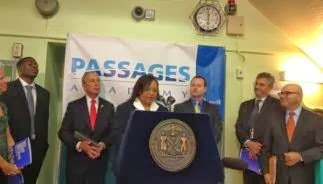 Is she trying to have those parents, teachers and children who were harmed back when she was Principal of PS 6, at Region 8, Superintendent of District 15 and Deputy Chancellor under Mayor Bloomberg "forget" what happened and start over? Or is her current agreement with the G&T parents in Queens to have their kids skip any testing for the Middle School simply a part of her honeymoon with NYC? When Carmen was Principal of PS 6, she destroyed the G&T program because she thought that G&T led to favoritism. She wanted all kids to learn in the classroom, so the kids that scored 1 or 2 on tests should be brought to a high 2 or even a three, and kids that scored a 3, or 4 could be brought to a low 3 or high 2, and then the young teachers without tenure who were hired to replace the tenured teachers with high salaries could succeed in teaching the Whole Language and TERC math curricula.....often cited in articles and websites as part of the "dumbing down of America". I guess we will have to see what happens next. 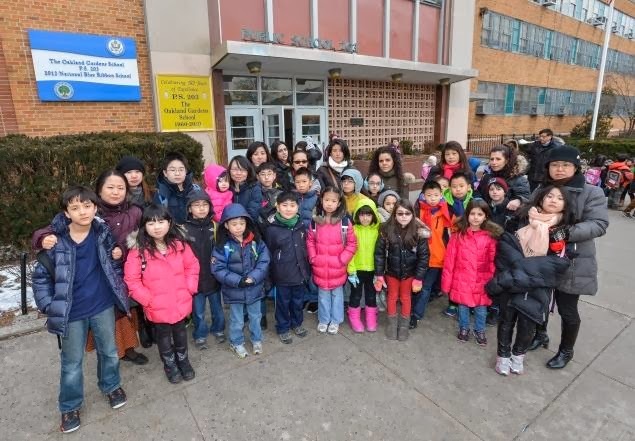 Parents of students in the gifted and talented program at Public School 203, in Oakland Gardens, Queens, are pleased that their children will be automatically accepted into the middle school G&T program. Don’t mess with the parents of the brightest students in northeast Queens. The city backed off a hotly contested plan on Tuesday to force elementary students in the gifted and talented program in District 26 to reapply for the coveted middle school seats. The stunning reversal came after parents raised the war cry. 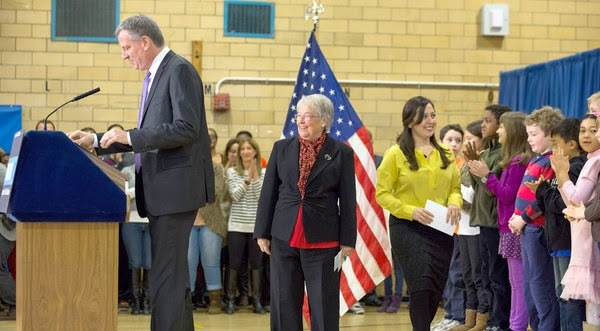 The Department of Education — under new Chancellor Carmen Fariña, agreed to grandfather current gifted students into the middle school program. Incoming kids will have to reapply based on their fourth grade ELA and math scores. District 26 — and 30, in northwest Queens — are the only two in the city that guarantee students the highly-sought seats. Once admitted to the elementary school program — based on performance on a pair of aptitude tests administered before kindergarten — students may stay through middle school. Students in all other city districts have to re-apply. The Department of Education did not provide answers to questions about changes to the program, but parents took it as victory and said they were pleased. She helped collect almost 800 signatures protesting the city’s decision to base middle school admissions to the gifted and talented program on test scores. Parents — who typically jump through hoops to get their children a seat in the program — only learned of the policy change late last year, after their kids had already taken the state exams. Students classified as gifted and talented learn at a faster pace and can typically do work at least a grade level ahead of their peers. City education officials pledged to add more middle school classes for students not already enrolled in the gifted and talented program. “We just want to have the opportunities for students,” said Jeannette Segal, president of Community Education Council in District 26. She was optimistic that the city’s abrupt about-face was a departure from the Bloomberg administration’s our-way-or-the-highway style of decision-making. “It gives me hope that parents are going to have a say, finally, in their children’s education,” Segal said of the new administration. City Councilman Mark Weprin (D-Oakland Gardens) also said he is cautiously encouraged.